The city of Würzburg is located in Lower Franconia in the north part of Bavaria. 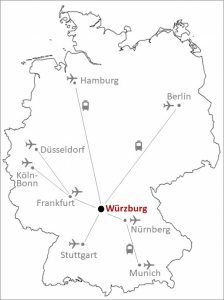 International Airports close to Würzburg are: Frankfurt, Nürnberg, Stuttgart or Munich. Würzburg is connected to the German railway system with intercity trains arriving and departing regularly.